What adjustments can I make with the mouse platform? The mouse platform slides through the tray from right to left, allowing for ambidextrous mousing. 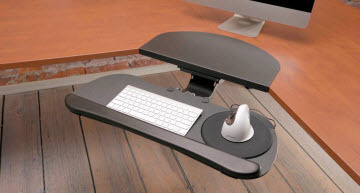 You can also move the mouse platform closer to or farther from your body to place the mouse in the most comfortable position.